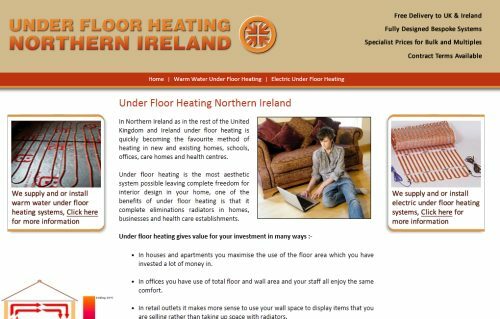 In Northern Ireland as in the rest of the United Kingdom and Ireland under floor heating is quickly becoming the favourite method of heating in new and existing homes, commercial and healthcare buildings. There are two different types of underfloor heating available, either using an electric or piped warm water system and Total Floor Heating can install both. We built a mini site specifically to advertise this business. Mini sites are an ideal way to advertise one specific part of your business quickly and cost effectively.